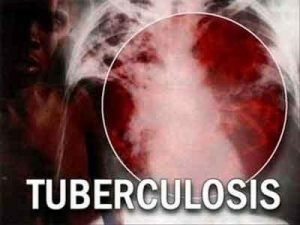 Tuberculosis (TB) is an infectious disease caused predominantly by Mycobacterium tuberculosis and among the leading causes of mortality in India. India accounts for 1/5 of the global TB burden. Pulmonary tuberculosis is the most common site for tuberculosis but it also affects other sites, which is called extrapulmonary tuberculosis. These guidelines describe the level of care that all practitioners, public and private should seek to achieve, in managing patients who have, or are suspected of having tuberculosis. The basic principles of care for persons with, or suspected of having tuberculosis are: establishing diagnosis promptly and accurately; giving standardized treatment regimens of proven efficacy under supervision; monitoring response to treatment. The practitioners must not only ensure that each and every individual patient is cured of tuberculosis but also contribute towards cutting the chain of transmission, prevent emergence of drug resistance and thereby reduce the burden of tuberculosis. The diagnosis of tuberculosis in most cases is laboratory based and all efforts should be made to establish diagnosis based upon sputum smear microscopy in pulmonary tuberculosis cases. In all patients suspected of having extrapulmonary tuberculosis appropriate specimens from the sites of involvement should be obtained for microscopy, culture and histopathological examination. Patients who are negative for AFB in both the samples are to be prescribed a course of antibiotics for 10–14 days. Antibiotics of choice include co-trimoxazole, amoxicillin and doxycycline. Antibiotics which are active against tuberculosis (fluoroquinolones, clavulanate macrolides and streptomycin) must not be prescribed. Antibiotic trial is not indicated in human immunodeficiency virus (HIV)-infected patients and chest X-ray (CXR) needs to be taken to avoid delay in diagnosis of smear negative pulmonary tuberculosis. The diagnosis of extrapulmonary tuberculosis is based upon clinical suspicion, examination of appropriate specimens from the sites of involvement, by microscopy, culture and histopathological examination. In addition, examination of sputum and X-ray chest may also be useful, especially in patients with HIV infection. The diagnosis of drug resistant tuberculosis is laboratory based from quality assured, culture and drug susceptibility testing (C & DST) laboratory. Under RNTCP, 43 quality-assured C & DST laboratories are available across the country for diagnosis. Following categories of patients are considered as multidrug resistant tuberculosis (MDR-TB) suspects: all patients who have failed first line treatment, all previously treated patients; all HIV-TB co-infected patients, any smear positive follow-up new or previously treated patients and all pulmonary tuberculosis cases who are contacts of MDR-TB. The following diagnostic technologies are currently available under RNTCP and recommended for diagnosis of MDR-TB (Table 1). Revised National Tuberculosis Control Program recommends rapid molecular tests as a preferred modality to diagnose patients early in the course of their illness and place them on appropriate treatment. The goal of treatment of tuberculosis is to ensure high cure rates, prevent emergence of drug resistance, minimize relapses and cut the chain of transmission through early diagnosis and treatment. Treatment of tuberculosis is not only a matter of individual health; it is also a matter of public health. All practitioners who undertake to treat a patient with tuberculosis must not only prescribe a standard regimen but also have the means to assess adherence to regimen and address poor adherence in order to ensure that treatment is completed. For the purpose of treatment, tuberculosis patients are classified into two groups, namely, “New” or “Previously Treated”, based on the history of previous treatment. All patients (including TB-HIV co-infected) who have not been treated previously should receive 2 months of isoniazid (H), rifampicin (R), pyrazinamide (Z) and ethambutol (E), i.e. intensive phase (IP). The continuation phase (CP) consists of isoniazid and rifampicin given for 4 months. All drugs used for treatment of tuberculosis should have a known bioavailability. When a second individual observes a patient swallowing medications, there is greater certainty that the patient is actually receiving prescribed drugs. This approach results in high cure rate and a reduction in risk of drug resistance. Intermittent administration of anti-tuberculosis drugs enables supervision to be provided more efficiently and economically with no reduction in efficacy. Revised National Tuberculosis Control Program uses short course chemotherapy given intermittently—thrice weekly under direct observation (DOTS) for both pulmonary and extra-pulmonary tuberculosis patients. If the sputum smear is positive after 2 months of treatment, the IP of four drugs (H, R, Z and E) is continued for another 1 month and sputum examined after the completion of the extension of IP. Irrespective of the sputum results after this extension of the IP, 4 months of the CP is started. If the sputum smear is positive after 5 or more months of treatment, the patient is declared as a “Failure” and is placed on the “Previously Treated” treatment regimen afresh, and sputum sent for C & DST to a certified RNTCP C & DST laboratory. All those patients who have received antituberculosis treatment for more than 1 month earlier are classified as “Previously Treated”. These patients are at a higher risk of having drug resistance. The IP consists of 2 months of isoniazid (H), rifampicin (R), pyrazinamide (Z), ethambutol (E) and streptomycin (S), followed by 1 month of isoniazid, rifampicin, pyrazinamide and ethambutol. Patient is subjected for follow-up sputum examination at the end of 3 months. If the sputum smear is positive at the end of 3 months of treatment, the IP is extended for another 1 month. Irrespective of the sputum results at the end of the extended IP, CP is started. If the sputum remains positive at the end of the extended IP, sputum is sent to a certified RNTCP C & DST laboratory for C & DST. The CP consists of 5 months of isoniazid, rifampicin and ethambutol given thrice a week on alternate days. 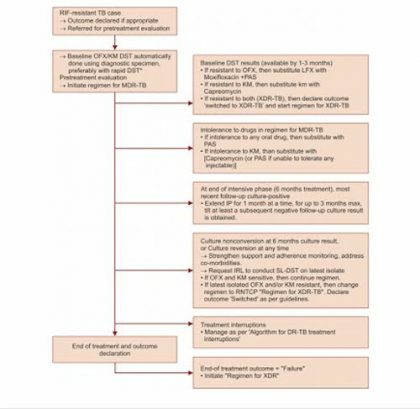 All “relapses, treatment after default, failures and others” are treated with the regimen for previously-treated cases: 2S3H3R3Z3E3/1H3R3Z3E3/5H3R3E3. Under RNTCP, drugs are supplied in patient-wise boxes (PWB) containing the full course of treatment and packaged in blister packs. The PWB has a color code indicating the two regimens—red for “new”, blue for “previously treated”. In each PWB, there are two pouches, one for the IP and one for the CP, for operational convenience. The dosage strengths are as follows: Isoniazid (H) 600 mg, rifampicin (r) 450 mg, pyrazinamide (Z) 1500 mg, ethambutol (E) 1200 mg, streptomycin (S) 750 mg. Patients who weigh 60 kg or more receive additional rifampicin 150 mg. Patients who are more than 50 years old receive streptomycin 500 mg. Patients who weigh less than 30 kg, receive drugs as per. Pediatric weight band boxes according to body weight. Pediatric cases are treated under RNTCP with the same thrice weekly short course chemotherapy regimens (“new” or “previously treated”) given under DOT as for adult patients. Pediatric patient-wise boxes are available with different dosages to be used under four weight bands for children weighing 6–10 kg, 11–17 kg, 18–25 kg and 26–30 kg. Intermittent short-course chemotherapy regimens of 6–9 months are given for all forms of extra-pulmonary tuberculosis. In cases of tuberculous meningitis, initial hospitalization is recommended. Ethambutol is replaced by streptomycin in the intensive phase and continuation phase of the treatment is for 7 months. Steroids as adjunctive therapy may be useful in pericardial and meningeal tuberculosis. Treatment of tuberculosis is the same as that for HIV-negative tuberculosis patients. In addition to tuberculosis treatment under RNTCP, all HIV-infected TB patients are provided access to care and support for HIV disease, including antiretroviral therapy (ART) irrespective of CD4 count. Co-trimoxazole preventive therapy is to be initiated for all HIV-infected patients. Streptomycin is absolutely contraindicated during entire pregnancy. Breastfeeding can be continued even when mother is on treatment for TB but mother should continue to practice cough hygiene. Child should be administered preventive chemoprophylaxis as per guidelines. In rare and exceptional situations, non-DOTS treatment (with a selfadministered non-rifampicin containing regimen) may be needed in a few TB cases, for example in patients with adverse reactions to rifampicin and/or pyrazinamide and new patients who refuse DOTS despite all efforts. This is a treatment regimen of 12-month duration comprising 2 months of she and 10 months of he (2 She/10 He). Preventive chemotherapy with isoniazid (H) must be administered to all the children aged 6 years and below who are in contact with smear positive pulmonary tuberculosis case. All patients should be monitored for response to therapy, best judged by follow-up sputum smear microscopy at the end of IP, 2 months after IP and at the end of treatment. In patients with extrapulmonary tuberculosis and in children, the response to treatment is best assessed clinically. Follow-up radiological examinations are not recommended and may be misleading. An MDR-TB case is a TB patient, whose sputum is culture positive for Mycobacterium tuberculosis and is resistant in vitro to isoniazid and rifampicin with or without resistance to other anti-tubercular drugs based on DST results from a quality assured certified C & DST laboratory. An extensively drug resistant tuberculosis (XDR TB) case is an MDR-TB case whose M. tuberculosis isolate is resistant to at least isoniazid, rifampicin, a fluoroquinolone (ofloxacin, levofloxacin, or moxifloxacin) and a second-line injectable anti-TB drug (kanamycin, amikacin, or capreomycin) at a quality assured certified C & DST laboratory. It is well known that poor treatment practices breed drug resistance. Widespread and irrational use of anti-tuberculosis drugs is fuelling the emergence of drug resistance tuberculosis in our country. Well administered first-line treatment for susceptible cases is the best method to prevent the development of drug resistance in such cases. Prevention of emergence of MDR-TB in the community is more imperative rather than its treatment. Early diagnosis of MDR-TB cases and adequately administered treatment regimens are essential to control the further transmission of disease. Revised National Tuberculosis Control Program uses a standardized evidence-based regimen for treating MDR-TB cases. The choice between hospitalization and ambulatory treatment depends on several factors in addition to the severity of the disease. Such factors include the availability of hospital beds, the availability of trained personnel at hospitals and clinics, availability of a mechanism to ensure adherence and social support network to facilitate adherence to ambulatory treatment, and the presence of other clinical or social-economic conditions of the patients. The results of MDR-TB suspects from a quality-assured laboratory take a variable time depending upon the technology available. The approach to initiation on treatment depends on the efficiency of laboratory services and results. If the LPA results are available within 7 days of sample collection, the patient may be directly placed on the appropriate DST-driven regimen, i.e. For R-resistant patients, do a pretreatment evaluation for starting on a standardized regimen for MDR-TB. The patient should be hospitalized for pretreatment evaluation and treatment initiation. Pretreatment evaluation includes a thorough clinical evaluation, CXR and relevant hematological (complete blood count, blood sugar, liver function tests) and biochemical tests (blood urea, S. Creatinine, TSH, urine examination). A proper pretreatment evaluation is essential to identify patients who are at increased risk of developing such adverse effects from treatment. Pretreatment evaluation for XDR TB should include ECG, serum electrolytes and surgical evaluation. Patients need to be counseled on the nature and duration of treatment, need for regular treatment, possible side effects of drugs and the consequences of irregular treatment or premature cessation of treatment. It is advisable to involve close family members during the counseling, since family support is an essential component in the management. Female patients should receive special counseling on family planning. Ideally, all MDR-TB patients should be screened for additional drug resistance (second line DST) before initiating treatment. However, if laboratory capacity for performing second line DST is constrained, then patient should be started on MDR-TB treatment. All those patients who show culture-positivity as of 6-month and culture-reversion at any time during the treatment must be subjected to second line DST to stratify patients and offer appropriate treatment. The treatment is given in two phases, the intensive phase (IP) and the continuation phase (CP). This regimen comprises of six drugs— kanamycin, levofloxacin, ethionamide, pyrazinamide, ethambutol and cycloserine during 6–9 months of the intensive phase and four drugs—levofloxacin, ethionamide, ethambutol and cycloserine during the 18 months of the continuation phase. All drugs should be given in a single daily dosage under supervision. 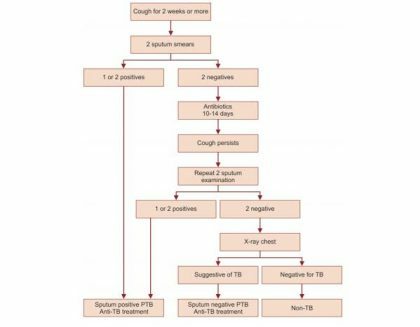 Pyridoxine should be administered to all patients on the regimen for MDR-TB. The total duration of treatment for MDR-TB is 24–27 months, depending on the IP duration. IP should be given for at least 6 months. After 6 months of treatment, the patient will be reviewed and the treatment changed, based upon the culture result. The IP can be extended up to a maximum of 3 months after which the patient will be initiated on the CP irrespective of the culture result. The recommended duration for CP is 18 months. All XDR-TB patients should also be subject to a repeat full pretreatment evaluation, but also including consultation by a thoracic surgeon for consideration of surgery. Identification must be done for the site (tertiary centers) with such surgical facilities. The “intensive phase” will consist of seven drugs—capreomycin (Cm), PAS, moxifloxacin (Mfx), high-dose INH, clofazimine, linezolid and amoxiclav. The “continuation phase” will consist of six drugs—PAS, moxifloxacin (Mfx), high-dose INH, clofazimine, linezolid and amoxiclav. The dosage of the drugs would vary as per the weight of the patient. All drugs are to be given on a daily basis. The regimen for XDR-TB would be of 24–30 months duration, with 6–12 months intensive phase (IP) and 18 months continuation phase (CP). The change from IP to CP will be done only after achievement of culture conversion, i.e. two consecutive negative cultures taken at least 1 month apart. In case of delay in culture conversion, the IP can be extended from 6 months up to a maximum of 12 months. Direct observation of treatment remains even more crucial, as this is the last chance at successful treatment that these patients will have. The patients with drug resistant TB need to be monitored regularly using clinical and laboratory parameters. Close monitoring of patients is necessary to ensure that the adverse effects are recognized early. Patients should be seen by the practitioner for clinical evaluation at monthly intervals during the IP, after discharge from the hospital, and at 3-monthly intervals during the CP, until the end of treatment. Because of the use of drugs with different toxicity profiles, XDR-TB requires more intensive monitoring during follow-up, that includes complete blood count, kidney function test, serum electrolytes, liver function tests, monthly in IP and 3 monthly during CP and CXR every 6 months. The most important objective evidence of response to M/XDR treatment is the conversion of sputum culture to negative. Smear conversion is less reliable than culture conversion, which reflects viability of tubercle bacilli and is a more accurate reflection of response to treatment. Patients will be considered culture converted after having two consecutive negative cultures taken at least 1 month apart. For follow-up examination, sputum specimens will be collected and examined by smear and culture at least 30 days apart from the 3rd–7th month of treatment (i.e. at the end of the months 3, 4, 5, 6 and 7 and at 3-monthly intervals from the 9th month onwards till the completion of treatment (i.e. at the end of the months 9, 12, 15, 18, 21 and 24).